Rebecca Murray, owner of highly regarded salon, The Style Lounge in Alderley Edge, was keen to revamp her salon to bring it up to date with the latest trends. The traditional creams and golds were exchanged for an array of greys and whites, creating a lighter and more vibrant atmosphere in the salon. Rebecca opted for a colour scheme that would compliment the existing furniture and fittings, including the stunning marble desk that sits prominently at the front of the salon. 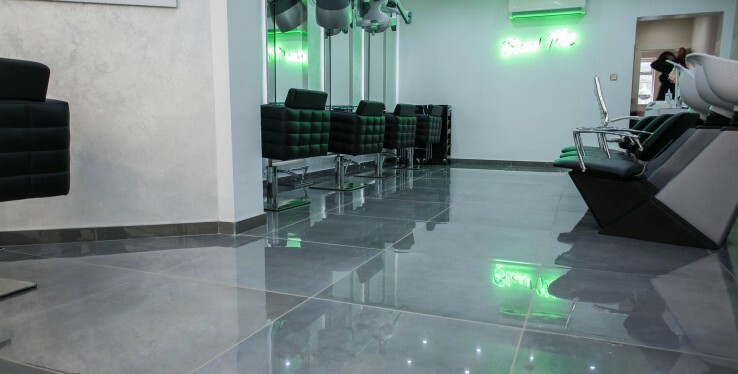 The salon's first floor has been re-designed using Real Stone & Tile's large format Skylab Mercury Grey Tiles. Their gloss finish allows light to reflect off the tiles, illuminating the upper floor, creating that all important luxury feel for the salon's esteemed clients. Rebecca's husband, who has used Real Stone & Tile many times before, recommended the company. Rebecca explained, "My partner builds houses and regularly uses Real Stone & Tile; he took me down to the showroom and I explained to the team the look I was going for. Leigh showed me a range of gorgeous tiles and it was the Skylab that stood out for me."